closure of the old access trail. 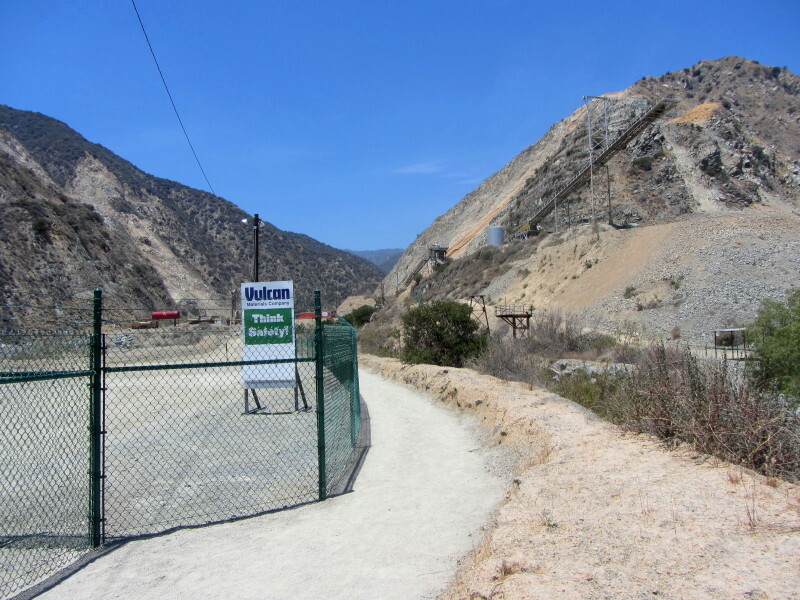 The history of this trail goes back to 1956 when Azusa Rock began quarry operations in the month of Fish Canyon. They erected fences and placed guards to block the public from walking into canyon and visiting one of the most beautiful waterfalls in the San Gabriel Mountains. After more than 30 years of protests from hikers, the company finally conceded and constructed an access trail around its diggings in 1988. Problem was, in the words of John McKinney, �this path was a bloody awful, precipitous route over rocky, unstable slopes.� Hikers had to suffer another decade of virtual inaccessibility to Fish Canyon. Finally, the city of Duarte came to the rescue. With grant money and teaming up with a conservation corp, they constructed a new access trail which opened on June 6, 1998. 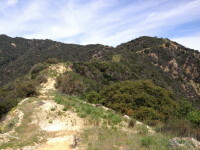 The trail started at a dirt parking lot on Fish Canyon Road and steeply climbed the mountain�s rugged south face 1.3 miles to a crest. It then proceed along a more temperate route through quarry property before climbing a nasty steep dozer swath to the national forest boundary, 1.9 miles from the start with 1,400 in elevation gain. The route then turned east and followed a steep, zigzagging trail dropping 1.1 miles and 1,100 feet to join Fish Canyon Trail near the bottom of the canyon. At that point, the hiker could enjoy a pleasant two-mile saunter up canyon to beautiful Fish Canyon Falls. The new trail indeed provided access to Fish Canyon, but it turned a pleasant 5-mile round-trip hike with only 800 feet of elevation gain to a 9-mile round-trip hike with 3,200 of elevation gain. Those stats are not that bad in themselves, but what made the hike horrible was the poor quality of the trail, particularly the first segment. It was steep, narrow, loose, slippery, rugged, and brushy. Bottom line, it was an awful trail and made a punishing hike. After Vulcan Materials bought the quarry from CalMat in 1999, they began to court the public with a plan to shift the mining operation from Fish Ridge on the east to Van Tassel Ridge on the west. And one of the promises was to build a new access trail going directly through the quarry. On July 17, 2010, the Azusa city council voted to approve a new mining plan and on January 25, 2011, Azusans voted to uphold the city council decision. Finally in 2013, after some legal challenges, the courts upheld the plan and Vulcan was given the green light to move forward. One of the first orders of business was to build the new access trail, which was opened to the public on June 21, 2014. With the new access trail open, the old access trail was closed from the trailhead to the national forest boundary. Thankfully, the 1.1-mile segment of the old access trail connecting Fish Canyon Trail to Van Tassel Ridge remained in place. This present hike uses the new access trail through the quarry, crosses the bridge into the national forest, proceeds 0.1 mile to the junction, and then climbs the old access trail 1.1 miles with 1,100 feet gain to Van Tassel Ridge. The trail is steep (1,000 feet per mile! ), narrow, brushy, and somewhat dicey in places. And it hosts lots of poison oak. The payoff is a great workout, splendid views of Fish Canyon and the quarry operation, and a nice perch high on Van Tassel Ridge. But you�ll want to be in good shape, wear long pants and boots with traction, and avoid hot weather. As a general rule in the San Gabriels, the front range is best hiked in the cooler months, and the back range is best in the warmer months. This front-range hike is steep and mostly without shade, and so it can be grueling on a hot day. Hiking to Van Tassel Ridge is best in winter or spring after some good rain and when the vegetation is green and soft and less brutal. In the spring the blooming flowers can be quite nice, but watch out for ticks and snakes. Early in the summer, the "June Gloom" (marine layer, coastal fog) can make nice walking conditions but also can greatly obscure your views. In the winter, beware that the poison oak will have lost its leaves but the toxic oils on the dead-looking, twiggy branches can still affect you if you come in contact. See Seasons of the San Gabriels for a detailed description of minding the seasons. From the I-210 Foothill Freeway, traveling west: exit at Irwindale Avenue in Irwindale. Turn right (north) and go 0.2 mile. Turn left (west) on Foothill Blvd. and go 0.7 mile to Encanto Parkway. Turn right (north). From the I-210 Foothill Freeway, traveling east (or the I-605 traveling north): Exit Mt. Olive Avenue in Duarte. Turn right (east) on Huntington Drive and go 0.6 mile to Encanto Parkway. Turn left (north). 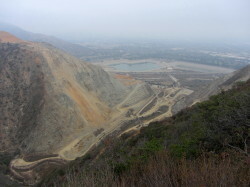 Drive north on Encanto Parkway 1.7 miles to the entrance of Vulcan Materials Azusa Rock quarry, 3901 Fish Canyon Road. The gate on the left is the quarry entrance. The gate on the right is the dedicated entrance to the trailhead parking lot. OPEN April - September: 7 a.m. to 7 p.m.
October - March: 7 a.m. to 5 p.m. Trail gates are closed and locked when hours end, including the gates for the parking lot. Cars left in the lot after hours will be towed at the car owner�s expense. After hours calls for assistance must be directed to the Azusa Police Department at (626) 812-3200. Park in the parking lot (a Forest Adventure Pass is not needed). Note: long pants are recommended. From the trailhead parking lot, pass by the kiosk and through the gate to the trail. Turn left and follow the fenced trail through the quarry. 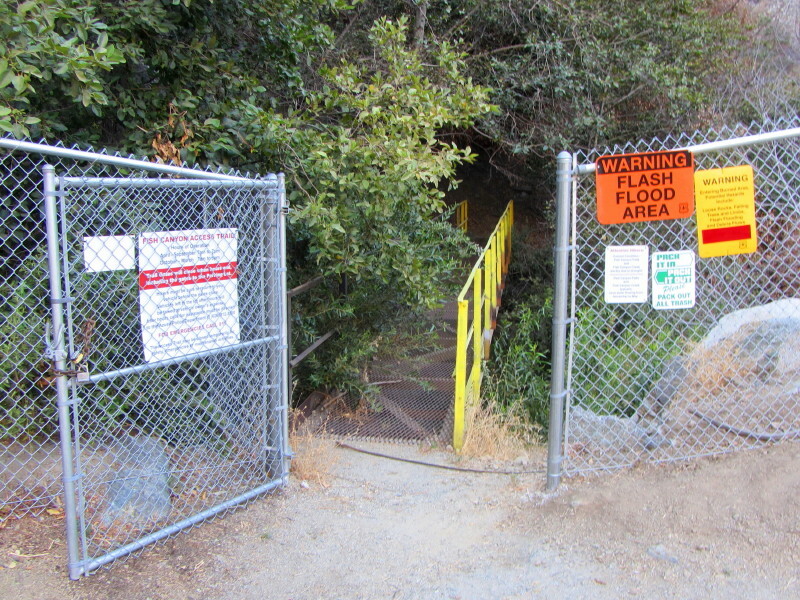 Vulcan deliberately placed one of the trail fences on the other side of the creek so hikers won�t feel they are walking through a cattle chute. So please obey the signs to stay on the trail and not to trespass on protected vegetation, soil, and watershed along the steam-side (riparian) area on Vulcan property. Soon you will reach a crossing gate and pass to the west side of the quarry road. Steep Canyon walls tower above you. When you pass the big rock you transition to a more natural footpath along the restored riparian area. The Wildlife Habitat Council has certified Vulcan�s efforts to return Fish Creek to its pre-mining configuration and restore its biological and hydro-geomorphologic characteristics. At 0.7 mile you reach the bridge and the boundary of the Angeles National Forest (870'). Cross the bridge and follow the trail upstream. In a couple minutes the trail negotiates a pair of switchbacks on the west slope before it arrives at a trail junction just shy of an interruptive sign (0.1 mi. from the bridge). Take a sharp left on the Van Tassel Ridge access trail. The narrow path wastes no time in zigzagging steeply up the west canyon wall. Watch out for poison oak; it grows in abundance along the trail. Soon striking views open up to the massive quarry to the south and the rugged canyon to the north. 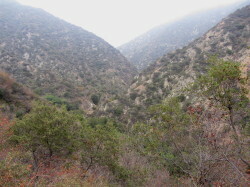 In the late winter and early spring, the thick chaparral is lush and jungle-like and provides some nice shade and a very pleasing environment (fern, honeysuckle, scrub oak, laurel sumac, lemonade berry, toyon, California buckwheat, sage, poison oak). In the spring you are treated to array of wildflowers. At about two thirds the way up the trail there is a spur path to the left which immediately opens to a large flat spot. It�s worth taking a few minutes to enjoy the views from here. A Metropolitan Water District survey maker marks the location. Continue up the trail. 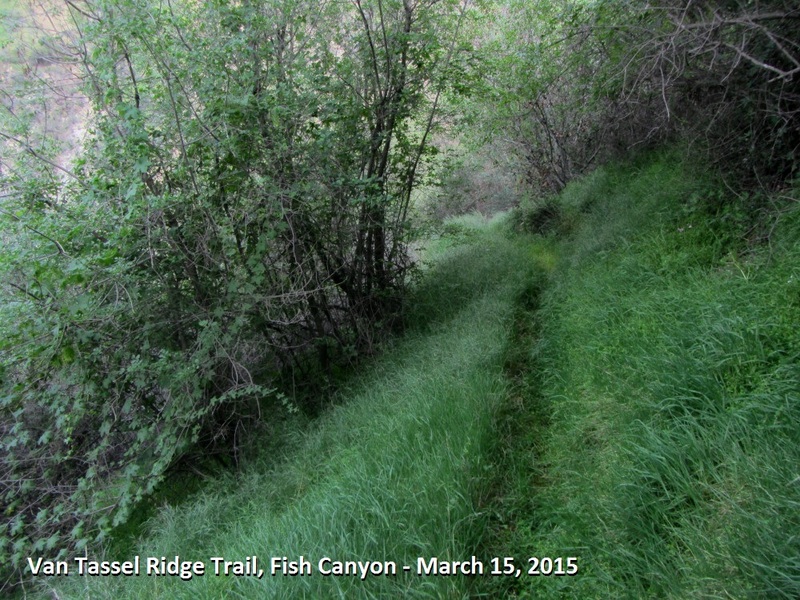 At 1.4 miles from the start you arrive at Van Tassel Ridge (2080�). To your immediate south a fence separates the national forest from the Vulcan quarry below. On a clear day, you are treated with splendid views out over Azusa, Duarte, and the east end of the San Gabriel Valley, and on the distant horizon, the Pacific Ocean and Catalina Island. To the west is Van Tassel Canyon and on its west ridge line you can see Van Tassel Fire Road heading north en route to Mt. Bliss. If you are inclined, feel free to climb the ridge and explore further (see Upper Van Tassel Ridge below). Return the way you came. 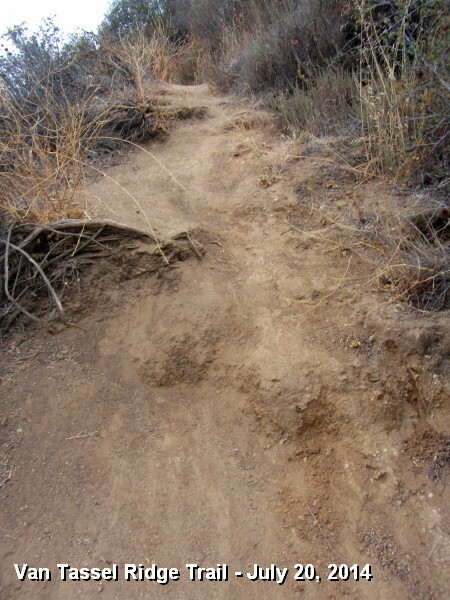 Trail Condition Update - 3-15-15 - The trail continues to be in passable condition. It does not appear to have had any formal maintenance since I hiked it on 7-20-14. Most of the plants on the trail tread were the soft weedy grasses. Some parts of the trail look pretty good and others are cloaked in vegetation and virtually invisible but easily passible. There was a lot of poison oak but avoidable with care. Everything was lush and green from winter rains and there were many plants in bloom. There were lots of pesky bugs and I encountered a large rattlesnake. I enountered only one other hiker on the trail. See blog post for details and photos. 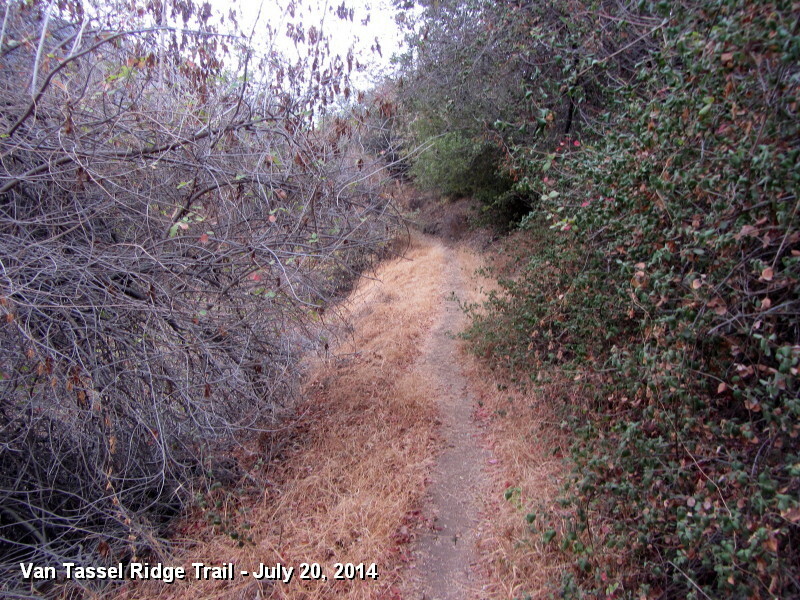 Trail Condition Update - 7-20-14 - The trail was in pretty good condition aside from several portions that were badly eroded due to foot traffic on the outside edge skirting unrestrained brush, but passable with care. There were a couple places near the top where the trail was precariously steep and with loose footing. There was unchecked brush crowding the path in many places. There was a lot of poison oak, and some intruded into the path, but avoidable with care. Non-native glasses and weedy plants, particularly the mustard, were deed and many encroached the trail. I was thankful for long pants. Virtually nothing was in bloom. With the record-low rainfall this year, everything was parched and dry. See my whole blog post. Upper Van Tassel Ridge - From the national forest boundary on Van Tassel Ridge (2080'), the ridge climbs north and northwest toward Mt. Bliss and White Saddle. 3-15-15 - I hiked from the forest boundary above the Vulcan property (2080�) to highpoint 2800+�. The route was reasonably clear and seems to be a doable route all the way to Mt. Bliss. See blog post for details. 7-20-14 - I observed that a fresh fire break had been cut up the ridge, which I understand was cut by the Forest Service during the September 2013 Madre Fire. 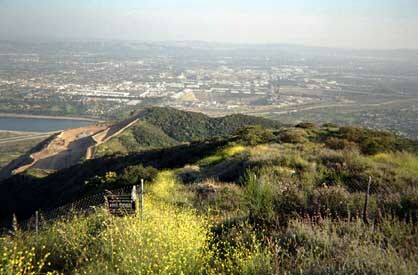 8-14-04 - My friend Albert and I explored further up the ridge looking for an alternate route to Mount Bliss. 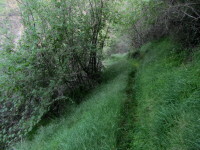 The brushprimarily buckwheat, chemise, sage, and some scrub oakwas thick and scratchy. It was obvious that others had gone that way, but there had not been enough traffic to make the route easily passable. After about 0.2 mile we achieved the highpoint on the ridge labeled 2364' on the topo map. The vantage point offered some nice views down into Van Tassel Canyon. However, to forge up the ridge further would take considerable effort, thrashing through the unforgiving chaparral. And from that point we could see that there was not a clear route to climb the steep pitch to the high point labeled 3136'. In Azusa - Robinson and others cite this trail as starting from Duarte, when in actuallity, it is within the Azusa city limits. ARCHIVE PAGE: Old hike description for Van Tassel Ridge - This page for HISTORICAL PURPOSES ONLY. Fish Canyon Falls Hike Description - A complete trail guide for an out-and-back hike via the canyon trail. Mount Bliss Hike Description - A complete trail guide for a hike to this 3720-foot-peak at the head of Van Tassel Canyon. Trail Guide and Background - Tom Chester has assembled thorough historical information for the background for access to Fish Canyon. This page was last updated April 7, 2015.